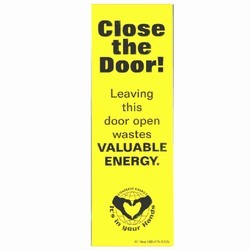 Our energy conservation door decals can be purchased as-is, customized or we can create a new design for your needs. AI-eddoor202-02a - Close the door! Leaving this door open wastes valuable energy. 1 Color Energy Conservation Vinyl Decal, Black on Yellow Vinyl, 2" x 7" - custom labels, custom stickers AI-eddoor202-03 - Leaving this door open for ____ hours/day costs $ _____/year. 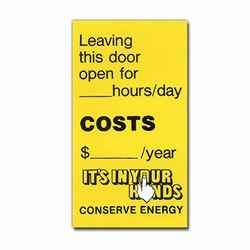 It's in your hands.1 Color Energy Conservation Write-In Door Decal, 2 1/2" x 4 1/2" AI-eddoor202-05 - Close the Door! Leaving This door Open Costs $$$$$$. 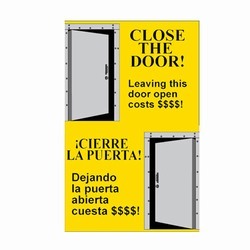 1 Color Energy Conservation Door Decal, English/Spanish, 7" x 11"